A woman from New Jersey, who’ll remain nameless, waited until the fourth race to redeem her coupons for free long-sleeved tee-shirts. At 11:30 am, the lines wound from the top of the stretch to the finish line and back again to one redemption outpost and from Big Red Spring to the far eastern grandstand entrance gate and back again to the second. Then, by 2:30 pm, the wait lasted only 20 minutes. Caption: People facing right in the same tee-shirt line as people facing left. "I don’t know why I’m waiting on line like this,” the woman from New Jersey complained. “They’re so ugly,” she said, right before turning over a dozen coupons to a woman dispensing the giveaway and scampering off with her arms draped with the complimentary schmatte. “I may have waited an hour and a half,” said Jim Egan of Ballston Spa, “But I got the sizes I wanted. They’re beautiful.” To Egan’s point, the track ran out of the small and large sizes entirely. Regarding the giveaways, someone at NYRA has his ear to the ground. They are fashionable, gift-worthy and collectible. NYRA used to chintz, leaving off information like the year - a desirable element on wearable items - and sourced useless gadgets to give away like a horse head coffee mug. Then a light bulb went on. Ball caps, umbrellas and beer coolers are far more popular. The tee-shirts were black with a white and red logo and date on the front and a white running horse on the back. 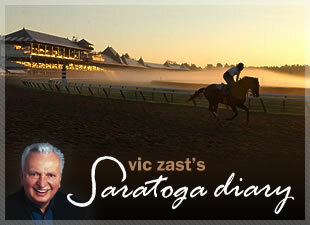 Saratoga’s announced attendance was 58,006 and about 25,000 people stayed to enjoy the sport. A carnival for kids in the backyard, with inflatable slides, climbing walls and jumping gyms, plus clowns and pony rides, gave parents someplace to take children while the old man was betting. 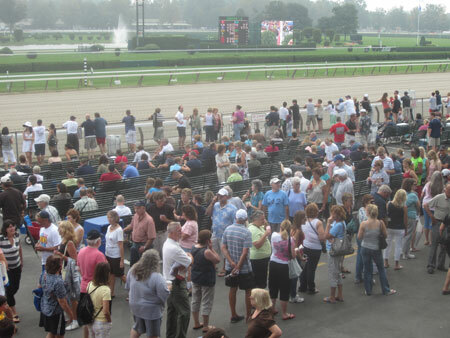 NYRA scheduled 12 races but held only 11. Officials tried to squeeze them all in before the thunderstorms hit by shortening the time between races but couldn’t. Miraculously, the 120th running of the gr. 1 Spinaway Stakes, Race 10, was contested only minutes before a downpour and the 104th gr.3 Saranac, Race 9, was run on the turf, as planned. Brilliant Speed, a son of Dynaformer and, thus, born for the turf, won the Saranac. Grace Hall, the 1A of an entry, won the Spinaway. There was a photo so close to call in Race 6 that fans held their breaths like kids in a car passing a cemetery. Heart of Destiny, ridden by Edgar Prado, just nipped a fast charging Pianist, tuned to an almost perfect pitch by trainer James Baker. Tom Durkin said, “They’re in the gate,” even though Salsa Mambo was being a wallflower behind it. Three of the first four finishers in the first race wore white hoods. The one that won didn’t. Former jockey, turned trainer, about to turn jockey again Robbie Davis gave the leg up to his daughter Jackie on Sandyinthesun in the eighth. Her horse beat one horse. Elton John played through a typhoon at SPAC. 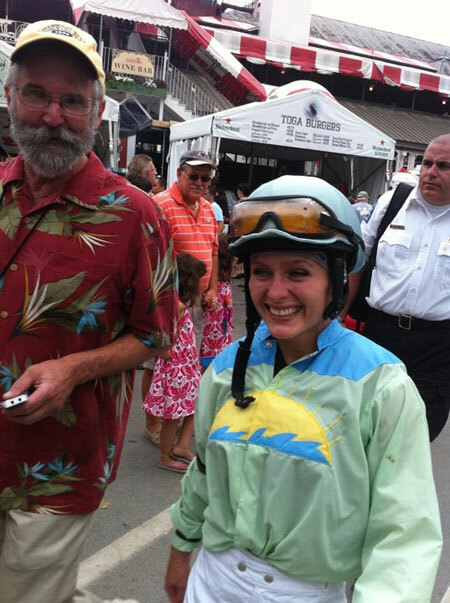 Caption: Jockey Jackie Davis at Saratoga, here from Suffolk Downs to ride for her father.